Platinum Hydraulics were recently commissioned to provide the hydraulic design for the Trade Waste Arrestor package for the new Westfield Coomera Shopping Centre precinct in South East Queensland. Challenges with this particular site included deep invert levels which create significant hydrostatic pressures. Due to the highly specified engineering of the Australian Tanks heavy duty anti-floatation designs, no further structural engineering for the application was required, therefore saving time and costs when compared to the original specified product. The Arrestors for this site were pre-approved by Gold Coast City Council and consisted up to 16,000Litres which allowed for multiple tenancy connections, as opposed to the costs involved in installing multiple units as originally specified on the development plans. Australian Tanks, having recently been added to the Gold Coast City Council list of approved treatment devices, proposed in conjunction with Platinum Hydraulics a solution built on its current range of Heavy Duty precast concrete tanks. In effect, we were able to tick the boxes on all of the application parameters with the added bonus of offering more treatment capacity (up to 16kl) allowing for the multiple tenancy connections. To ensure that all devices were compliant, Australian Tanks worked closely with Gold Coast City Council to acquire pre-approval prior to supply and installation. Working as a team, Australian Tanks, the Contractor and Platinum Hydraulics reviewed the original specification, calculated capacity requirements for each area, designed the individual tank capacities, then applied for the Gold Coast City Council approval. Fully operational Trade Waste Package solutions provided within specified timeframe. Fully compliant with all local council regulations. Delivered in time, and on budget. ​Platinum Hydraulic Design are proud to be collaborating with Christopher Contracting Plumbing & Drainage for the new Westfield Coomera Shopping Complex Development. ​Throughout the design phase, we were faced with particular challenges to overcome local authority requirements pertaining to the grease interceptor traps. Australian Tanks welcomed these challenges, and set out to provide a bespoke solution to the issues. 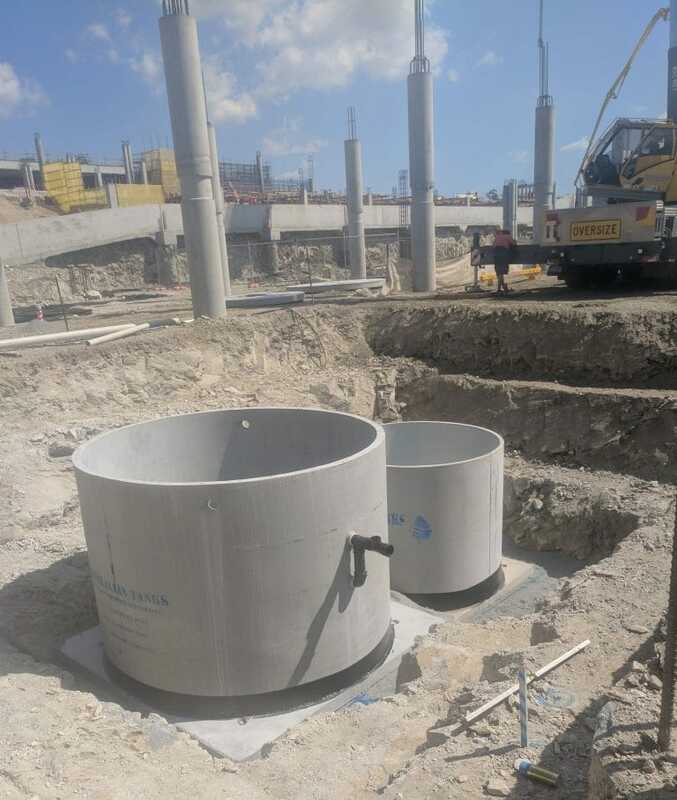 The professional manner in which Australian Tanks approached this project resulted with the successful installation of several large capacity grease interceptor traps that are fully compliant with the City of Gold Coast Trade Waste Department requirements. Congratulations to Henry Hape, Les Green and Team for the professionalism, and a quality product. If you’re interested in finding out more, please call one of our Civil Design and Business Development Specialists who can assist in developing a CAD driven design for your On Site solution in Water and Waste Water Detention, Retention and Collection. The Construction Revolution Has Arrived – Why you should be using pre-cast Onsite Detention Tanks.